On Friday 22nd June, AustCham Thailand, in collaboration with British Chamber of Commerce Thailand (BCCT), Thai-Canadian Chamber of Commerce (CANCHAM), Irish Thai Chamber of Commerce, Netherlands-Thai Chamber of Commerce (NTCC), New Zealand Thai Chamber of Commerce (NZTCC) and Singapore-Thai Chamber of Commerce (STCC), welcomed members and guests to Chiang Mai Sundowners at the Chiang Mai Exhibition and Convention Centre following the opening of the Chiang Mai World Fair (CMWF). Thank to our major event sponsors, BlackmoresThailand and AirAsia, and our venue sponsor, Chiang Mai International Exhibition and Convention Centre, for making this event successful. On Tuesday 19th June, 2018, AustCham in partnership with Austrade and QUT Creative Enterprise Australia, hosted a networking session at the Australian Embassy. 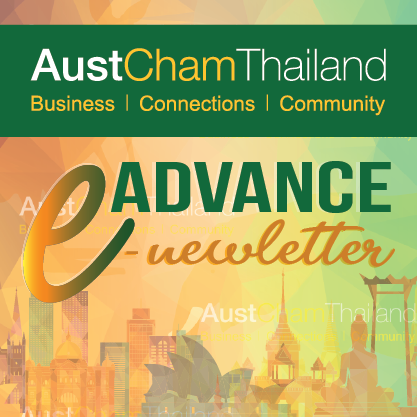 QUT CEA have brought a delegation of 12 start-up companies to Thailand as part of the Australian pavilion at Techsauce Thailand, and this session provided an opportunity for AustCham members to share their knowledge and experience on setting up a business in Thailand. Thanks to all those who participated and good luck to the QUT CEA start-ups! On Tuesday 19th June, 2018, AustCham in partnership with Austrade and the Australian Institute of Company Directors, hosted a breakfast briefing at the Australian Embassy. The briefing featured a presentation by Edward Palmisano, Head of International at the Australian Institute of Company Directors, who introduced the audience to key issues that will disrupt and change the way boards operate, including rapid change, the battle for trust, changing social licence, the need for diversity and the importance of culture. AustCham Thailand’s Manufacturing Committee held a briefing on “Automation at Visy Packaging, and the benefits it has brought to Quality and Productivity” yesterday at the Eastern Seaboard. We would like to thank Alex Gray, General Manager of Visy Packaging Thailand, for sharing insights on the level of Automation at Visy. Thank you also to WHA Corporation PCLfor providing the facilities. AustCham Thailand welcomed Khun Mechai Viravaidya, founder of Mechai Bamboo School​ and prominent Australian Alumni, to our June Sundowners last Wednesday. AustCham is a proud supporter of the Mechai Pattana School and we’re delighted to let our Members know that we donated 70,000THB from our CSR fund to support the school’s education, business and sports activities. AustCham members met with David Ness and Kate Evans from Home Affairs to discuss visa policies and requirements for Thai nationals entering Australia for employment purposes. Representatives from our Member companies ANCA, The Coffee Club (Minor Group), Novotel Sukhumvit 20 (Accor Hotels), and Visa Advice Centre, provided details of their business requirements for sending their Thai employees to Australia for skills development and career advancement opportunities. In return, David and Kate took on board the feedback to share with the Home Affairs department in Canberra and shared insights on how to better navigate the visa process.